Dr Russell Ward joined Courtfield in 2016. Originally from Surrey, Russell qualified at Nottingham University Medical School in 2008, having previously completed a separate degree in Biological Sciences at King’s College London. Part of his medical training was spent at Yale University Medical School, Connecticut. Before becoming a GP, he had previously been in surgical training. He then completed GP training, gaining the membership of the Royal College of General Practitioners. 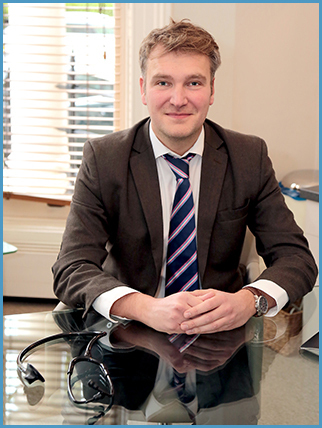 Prior to joining Courtfield, he worked for several leading London private practices as well as gaining much valuable experience in NHS general practice. In addition, he has worked for Night Doctor covering Courtfield out of hours. He has a particular interest in Men’s Health, but enjoys all aspects of General Practice having trained in Urology, Ear Nose and Throat, Emergency Medicine, Paediatrics, Psychiatry and General medicine. Russell enjoys spending time in the countryside when not busy in London, and is a keen tennis player.